I love the Blogger's Choice them in the Taste of Home Cooking Recipe Swaps. It is when you are given another blog, and you can cook any recipe in that blog. This time I was given the blog Oishii and I can't tell you how excited I was! I knew right away that I had to make an Asian dish as the authors lived in Japan for a few years. As I started to browse, I was checking off so many recipes that I decided to make 2 specifically for this swap. 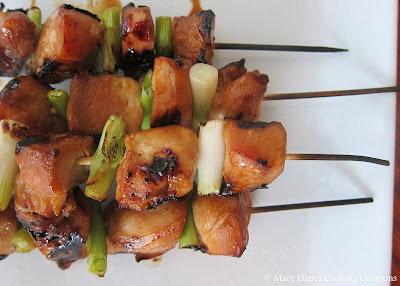 This first recipe is Yakitori, and I recognized it as something I have ordered in Japanese restaurants. The second recipe I chose was for Vegetable Lo Mein (see below post). I was surprised at the simple ingredient list for the marinade - just 3 things in the marinade. But wow, the flavor these 3 simple things gave the chicken was incredible. Jon and I ate every last piece of chicken - delicious!!! And because of the sugar in the marinade, it caramelized while on the grill, making it sticky sweet. We loved this! Here is the recipe. The original recipe calls for chicken thighs, but we used chicken breasts. Soak bamboo skewers in water for 30-60 minutes before cooking. Slice the thick part of the green onions into 1-inch long pieces, reserving the thinner green part for another use. Set aside. This looks great - can prep ahead and just throw em on the grill when I get home. Yum. You made great choices - I was hoping whoever got my blog would go for one of the Asian recipes :) Glad it was you! Both look delicious. 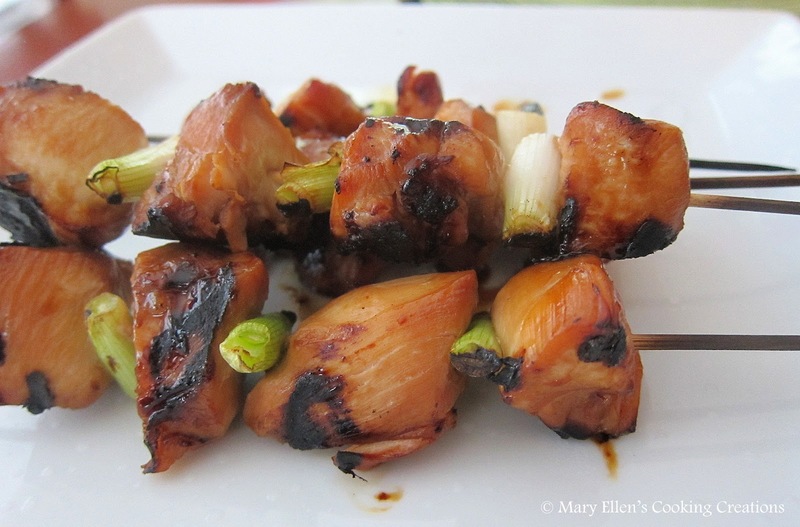 It's crazy how simple yakitori sauce is, isn't it? Yet tons of flavor. It's awesome when just a few simple ingredients combine to make a really delicious dish! These look and sound amazing! Love that you made two things. Both look great! Thanks for being part of the recipe swaps!